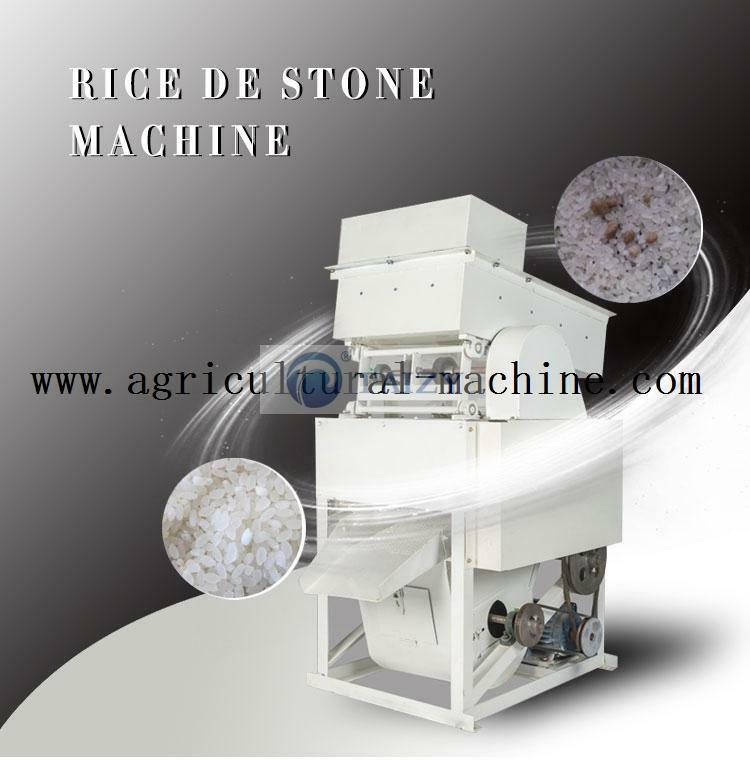 The rice destoner machine is mainly used in the grain processing plant, separating the stone and other impurities from crops such as wheat, rice. Its capacity is 1t/h and machine matches with the 2.2Kw motor. In most case, wheat and rice contain some stones that are not easy to remove, so this rice destoning machine solves this problem with high efficiency. Our wheat stone removing machine mainly consists of a big stone outlet, a impurity outlet, a clean rice outlet, a small stone outlet, and a rice feeding hopper. 2.2kw motor powers machine, so electric screen vibrates constantly. The stone is moving upward, while rice or wheat run in the opposite direction. After several minutes, clean rice, small stone, big stone, and other impurities go out from different outlets. High cleaning rate. The final rice is very clean without any impurities. The machine is stable during operation. High capacity. Its capacity is 1t/h. The machine is easy to use, saving time and energy. Before starting the machine, the user should check the screen surface and the fan carefully, whether the fasteners are loose or not, turning the pulley by hand. It can be started if there is no abnormal sound. The inclination of the screen should be between 10 ° and 13 °, and excessive inclination will stop the stones moving upward. Under this case, the speed of entering the selection chamber will decrease, which makes it difficult to discharge stone. In addition, the rice will move at a higher speed that triggers the final rice unclean. Therefore, the working inclination should be kept within the appropriate range and adjusted according to the amount of stone in the final rice. When the rice contains many stones, the inclination angle can be appropriately reduced. There should be appropriate rice in the inlet to prevent the rice from directly hitting the screen surface to affect the suspension state and stone removal rate. The air volume adjustment of the wheat destoner machine is based on the rice movement state on the screen and the quality of the final rice. If the rice vibrates sharply, it means the air volume is too large; if the rice is not loose and floating, it means that the air volume is too small. As a result, there are still stones in the final rice, and the damper should be adjusted in time. The sieve plate, the air distribution plate, and the air inlet door should keep the airflow unobstructed. If the screen hole is blocked, it can be cleaned with a wire brush. The operator should always check the number of stone in the final rice. The rice stone removing machines should be regularly inspected, and the bearings should be cleaned and replenished regularly. The idling test must be carried out after the inspection. Our customer from South Africa placed 500 sets rice destoning machine from us this year. We have cooperated with him many times and he works for local government. Therefore, we emphasize great importance to this wheat destoner in order to make him satisfied. We finished all the machines within one month and packed them carefully in case of any accidents during delivery. Until now, he has received machines and given us good feedback. What is the raw material of destoner machine? The raw material is rice and wheat. The cleaning rate is 98%, which means the final kernels are very clean. Why the final rice contains little stone? The wind volume is small and it should be adjusted in time.